These are fun rather than creepy or bloody. . .enjoy! Last edited by Bookworm J (129336295) on Tue Nov 13, 2018 11:42 pm, edited 1 time in total. Bookworm, I keep coming back to look...there's so much to see! Very talented and luv your work...again Gilmore Girls' is still my FAV probably because I'm partial to it because of the show! Need to stop by some more to finish seeing...my eyes are in LUV with your work! Tysm for sharing! Last edited by Bookworm J (129336295) on Wed Nov 28, 2018 2:07 am, edited 1 time in total. I like to visit a lot! lol In the 4th season now! Hey, you watch the newer release of Gilmore Girls? Is it good? And, am thinking of making a Stars Hallow as well...do you mind? And of course I don't mind - so fun! Thank you, Tuscany! BadMoon made it for me, I've never had one before!! Got a Christmas one too. . . 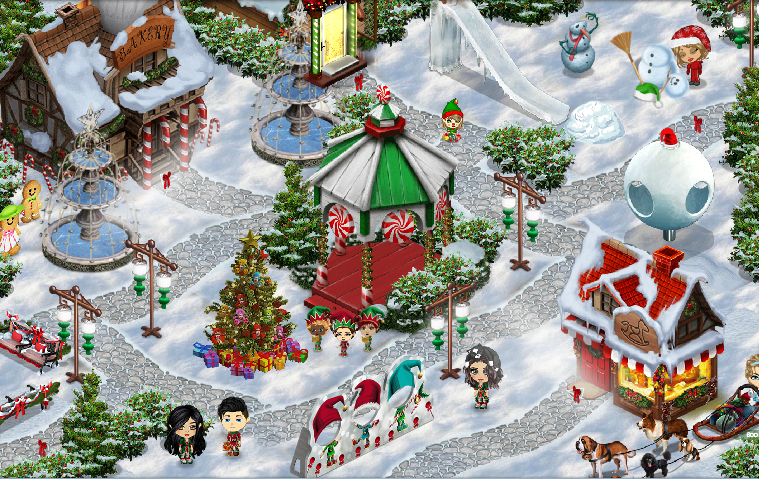 Created a Santa's Village avenue to link: Santa's Home, Elf Home, Santa's Sleighs, and Santa's Workshop. Of course it also links back into the rest of the town via the arrow by the butterfly. This is a work in progress inspired by the items in the database for the current Gem Event!! EDE2018, can't wait for all those cute Santa's Village buildings!! Last edited by Bookworm J (129336295) on Thu Dec 20, 2018 3:33 am, edited 1 time in total. Last edited by Bookworm J (129336295) on Thu Dec 20, 2018 5:06 am, edited 1 time in total. so much fun Bookworm, those coin holly trees are a big hit! And I've been adding links to get ready for the new buildings in the gem event that are coming, so Santa's Village now has a bakery, post office, toy store, and reindeer barn!